Mismatch Loss if often calculated from VSWR, but what does it mean and what are the limits of its validity? The formula used is MisMatchLoss(dB)=10*log(1-ρ2) where ρ=|Γ| and Γ is the complex voltage reflection coefficient. Since ρ=(VSWR-1)/(VSWR+1), MisMatchLoss(dB)=10*log(1-((VSWR-1)/(VSWR+1))2). So MisMatchLoss for VSWR=2 is 0.512dB, easy! MisMatchLoss is the ratio of power available from an ideal source in a load that is the conjugate of the source impedance, to the power in the mismatched load. It means here that if a load with VSWR=2 was connected to the source, that the power in the load would be 0.512dB less than in a matched load. In traveling wave terms, the power passing any point in a transmission line is given by P=real(V*conjugate(I)). When Z0 is real (lossless lines and distortionless lines), this can be simplified to Vf*If-Vr*Ir, often expressed loosely as forward power less reflected power. This formula is the basis for the formulas above, and the assumption that Z0 is real is rarely stated. is equal to the equivalent source impedance. if you have an antenna with a source impedance of 50+j5Ω, you cannot use the formulas because Zo must be equal to the equivalent source impedance and it must be real. If your scenario suits the underlying assumptions, VSWR calculator, RF Transmission Line Loss Calculator / Enhanced, and RF Two Wire Transmission Line Loss Calculator report MisMatch Loss. In cases where the assumptions do not apply, the MisMatchLoss cannot simply be calculated using the stated formulas, you need more information (the phase of of Γs and Γl), and recourse to conventional circuit analysis is necessary. 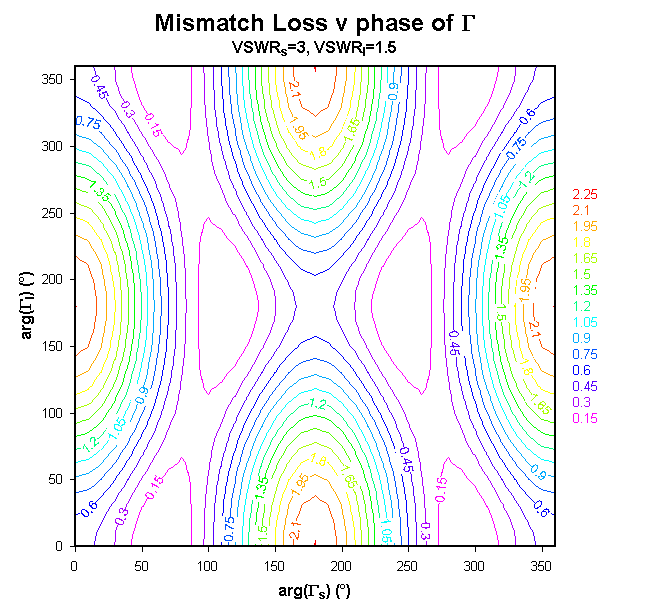 Above is a contour map of the MisMatchLoss vs phase of Γ for an example with source VSWR=3 and load VSWR=1.5. Whilst the simple formulas suggest that MisMatchLoss due to VSWR=1.5 is 0.18dB (independent of phase) and MisMatchLoss due to VSWR=3.0 is 1.25dB (independent of phase), the contour map shows that MisMatchLoss varies from 0.15dB to 2.25dB, depending on the phase of Γs and Γl. You need to know the phase of both to determine the MisMatchLoss.